How to run Windows on Android? 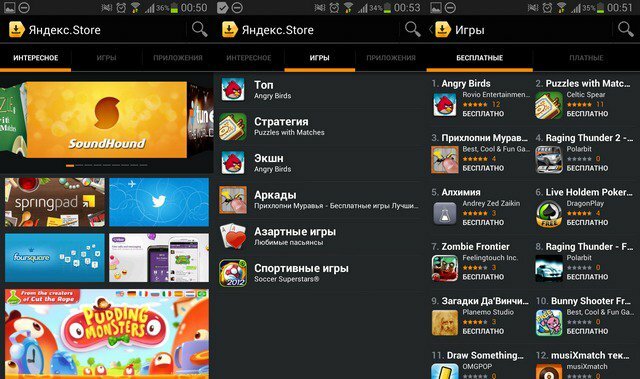 Yandex.Store - application store, which is an analogue of Google Play. The developer of the application is the company Yandex. You can find any software written for Android. The store has collected more than 100 thousands of different games and programs. Yandex store allows you to pay for paid products through a bank card or a mobile phone bill. Laconic theme that can emphasize the design of the store. This is an incomplete list of the merits. You can also highlight such a feature as the built-in application manager. Thanks to Yandex store, you can view all previously installed on the mobile phone program. You can download Yandex store from the official website “store.yandex.ru”. After the Yandex Market opens, you need to enter your mobile phone number in the appropriate field. Then a field will appear in which you need to enter a code confirming that you are not a robot. After that, you will need to click on the get button. Within 1 minutes, an SMS will be sent to the specified number. Now you will need to follow the link from the text message. Downloading the market takes only a few minutes. There is another way to download the "store". To do this, using a mobile phone, click on the “m.ya.ru/ystore” hyperlink. Immediately after that, the application will start downloading. When you start the market, the “Interesting” tab automatically opens. This section presents the most popular games and applications. It is only necessary to make a choice, since the store has a huge number of applets. To download the application there is a button "download" or "buy" (for paid products). It is worth noting that some free products have paid add-ons. To search for the program, the developers have added a search bar to the store interface. Simply enter the name of the program, and then click the magnifying glass icon. After that, the search result will appear in a list. When the installation is complete, you can run the application. During the first run you will see a small instruction. Thus, you can learn in detail about the capabilities of the program. It is worth noting that before downloading the programs you can familiarize yourself with their functionality. You can also view screenshots. Another interesting opportunity, Yandex Store can be considered a rating of programs. Thanks to this feature, it is possible to determine the most popular product. In addition to installing any applications, Yandex Store can act as a program manager. If you click on the item "My Applications" from the menu, then you can see all the previously installed programs. In the “store” settings, you can enable or disable notifications when new updates are released. In this case, you can set the type of network through which the program will be updated. To save mobile traffic, select “Wi-Fi”. It is important to note that in the settings you can also clear the query history. Yandex.Store is a good alternative to Google Play. Thanks to the intuitive interface and the lack of advertising, the “store” can become the main place to search for programs. Of course, some users may not like the service, but it is better to consider it. The ideal solution would be to install Google Play and Yandex Store on Android.